The Fayette Christian School Crusaders on the floor after winning the 2nd Annual McDonald’s Invitational Saturday, Jan. 26, 2019. (l-r); Justin Wines, Brady Bumpus, Drew Pontious, Spencer Hanusik, Christopher Tooill, Nicholas Epifano, Nate Crichton, Michael Miller, Xander Ivey and Lane Hufford. 2019 McDonald’s Invitational All-Tournament Team — (l-r); Nicholas Epifano, tournament MVP, Lane Hufford and Specer Hanusik, all from the Fayette Christian School Crusaders and from Pike Christian Academy, Koby Rothe and Chad Downing. Not pictured: Russell Barr and Coye Webster of Cozaddale Baptist Academy. The Crusaders’ Lane Hufford (12) drives past Slater Bakenhaster (25) of Pike Christian Academy during the opening round of the McDonald’s Invitational Tournament Friday, Jan. 25, 2019. Nicholas Epifano of the Fayette Christian School drives around a player from Pike Christian Academy in the first game of the McDonald’s Invitational Tournament Friday, Jan. 25, 2019 held at FCS. Epifano was named the tournament’s Most Valuable Player. 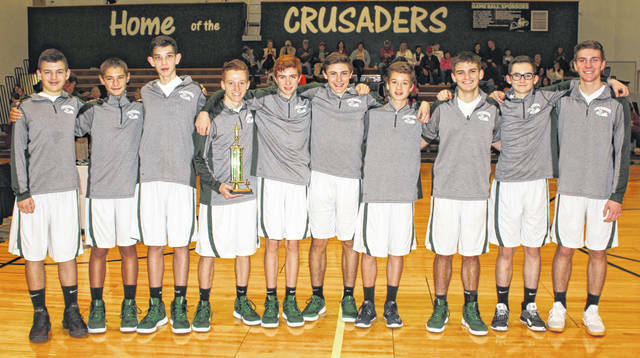 The Fayette Christian School Crusaders boys varsity basketball team won the 2nd annual FCS/McDonald’s of Fayette County Basketball Invitational Saturday afternoon defeating the Pike Christian Lions, 58-42. Pike County had defeated Cozaddale Baptist in the Saturday morning semifinals, 56-45, to set up a rematch between the two schools. “I was pleased with the way we played Friday, except for the first quarter and a half,” FCS head coach Gary Shaffer said. “We didn’t play with a whole lot of energy. We won that game. We came on in the last two and a half quarters and played well. “We played well in the second game against Cozaddale,” Shaffer said. “Today (Saturday), we did a lot of things, but we were just hurrying,” Shaffer said. “I don’t know if it was nerves, because they just told me they had never been in a situation like this, as far as winning. In the finals the Crusaders trailed 7-6 after the first period before going on a 14-5 run in the second period to take a 20-12 lead at the half. The Lions (3-4) couldn’t get closer than six points in the second half as both teams turned the ball over six times each giving their opponents matching eight points off turnovers. Nicholas Epifano for the third straight tournament game went over the 20-point mark putting in 21 points and grabbing 10 rebounds. Spencer Hanusik had 10 points while Lane Hufford and Michael Miller both scored seven points each. FCS was 14 of 22 from the free throw line and had 29 rebounds against the taller Lions squad who had only 21 rebounds. The Lions were led by Koby Rothe with 14 points and Austin Bro with six points. The Lions were 2 of 9 from the charity stripe. The Crusaders (9-4) have now won five games in a row and six of seven in the month of January. They wrap up the month Tuesday night on the road at Hillsboro Christian Academy. There will be three games — a junior high boys, girls varsity and then boys varsity. All three games will be on Facebook Live/McDonald’s Fayette Co. Ohio page starting at 5 p.m. In the opener they defeated Pike County Christian Academy, 58-42. 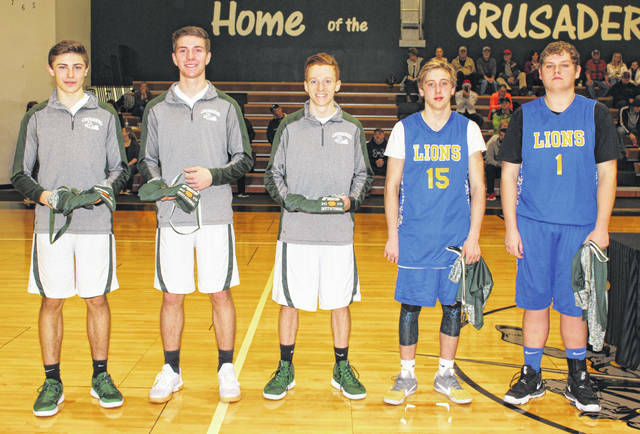 The contest was tight until with about three minutes left in the third quarter when the Crusaders broke a 30-30 tie and went on a 28-12 run over the last 11 minutes of the contest. 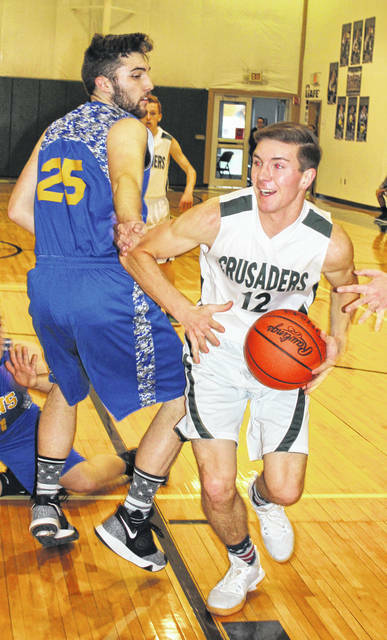 Nicholas Epifano led the Crusaders with 26 points (19 in the first half). Lane Hufford scored 15 of his 17 points in the second half. Other scorers included: Spencer Hanusik with eight points, Michael Miller with four and Zander Ivey with three points. With the win the Crusaders then played Cozaddale Baptist out of Goshen. The Crusaders jumped out to a 7-2 lead and were never serious challenged much during the rest of the contest. Again Nicholas Epifano led the team with 27 points in the 54-39 victory. Lane Hufford added 11 points, Spencer Hanusik again had eight points, Zander Ivey with six points and Michael Miller with two points.